Africa Day Fest 2019 will kick off with a bang. 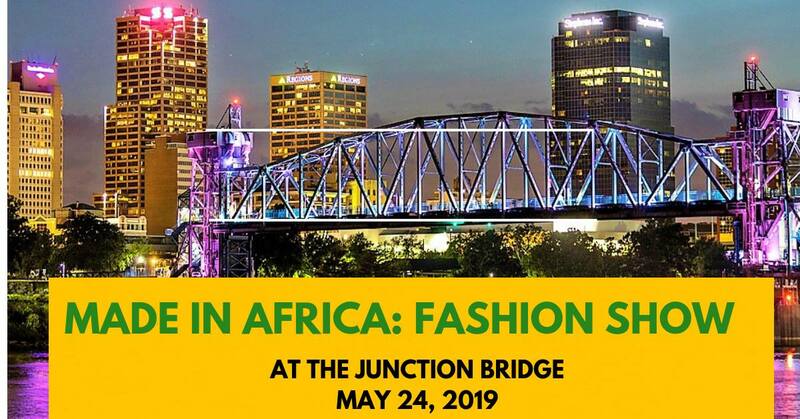 For the second time Made in Africa, an African Fashion show will take stage at Junction Bridge on Friday, May 24th, 2019 from 6pm – 9pm. Join us for this kick-off event featuring African designers and African hors d’oeuvre. Our mission is to raise awareness of African Fashion around the world, and empower African designers who embody creativity, imagination while remaining faithful to their dreams and cultures. Tickets are $30. All proceeds support Africa Day Fest. This is a private event. Be part of a glamorous evening for a cause! An Experience You Won’t Forget. Let’s Celebrate! Note: Access to the bridge is by a walkway (handicap accessible) directly behind the River Market pavilion on the Little Rock side and from Washington Street near Verizon Arena on the North Little Rock side.